Terror in the Tropics! Peril in Paradise! Betrayal on the Beach! It’s just another day of murder and corruption under the palm trees in CRIME DOWN ISLAND, now available from Pro Se Productions in digital and print formats. Six heated tales of manipulation and mayhem set in the dream destinations most fantasize about. Sun baked days and moon kissed nights along the ocean, where love and hate walk hand in hand. And the shrill of tropical birds can be drowned out at any moment by a horrified scream and the last gasps of someone dying. Evil takes vacations in the same places we all want to, thanks to authors Shannon Muir, Gordon Lendrum, Sharae Allen, Louis A. Rodiquez Jr., Jeff Hewitt, and Shane Bowen. CRIME DOWN ISLAND from Pro Se Productions. With an exotic cover by Larry Nadolsky and logo design and print formatting by Marzia Marina and Antonino Lo Iacono, CRIME DOWN ISLAND is available now at Amazon at https://www.amazon.com/Crime-Down-Island-Sharae-Allen/dp/1546904239/ref=sr_1_1?ie=UTF8&qid=1495941125&sr=8-1&keywords=crime+down+island and Pro Se’s own store at www.prose-press.com for 15.00. 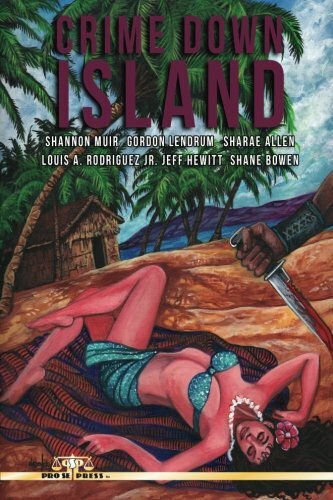 This tropical crime anthology is also available as an Ebook, designed and formatted by Lo Iacono and Marina for only $2.99 for the Kindle at https://www.amazon.com/Crime-Down-Island-Shannon-Muir-ebook/dp/B0728L8R7M/ref=tmm_kin_swatch_0?_encoding=UTF8&qid=1495941125&sr=8-1 and for most digital formats via Smashwords at https://www.smashwords.com/books/view/726614.